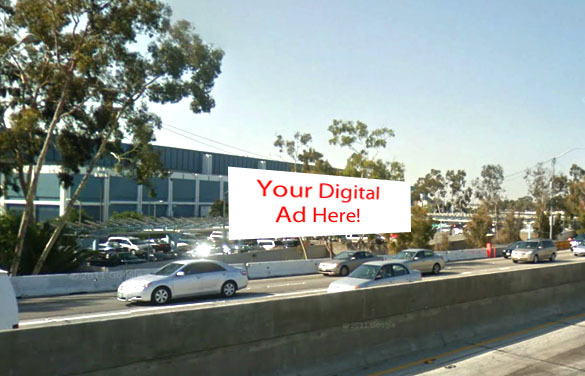 Area planned for 7 large scale digital billboards adjacent to 110 freeway. Building in background to be demolished for new NFL stadium. If AEG gets its way–and when hasn’t it?–more than a dozen large new digital billboards will face freeway drivers passing the L.A. Convention Center, L.A. Live, and the yet-to-be-built NFL stadium called Farmers Field. This sea of ever-changing brightness and color is being proposed by AEG despite the fact that back in 2009 the City Planning Commission turned thumbs down on digital billboards beaming their sales pitches from the convention center facade to the half million motorists negotiating the adjacent freeway interchanges. The digital billboard locations are detailed in a 10,000-page environmental impact report (EIR) submitted by AEG for construction of Farmer’s Field and re-construction of part of the city-owned convention center. Four would be placed in the center of the convention center facade, directly in view of drivers approaching downtown on the 10 freeway. The billboards would also be clearly visible to motorists negotiating the interchange of the 10 and 110 freeways. According to the EIR, the digital billboards that could advertise commercial products and services would refresh messages every eight seconds, which is the same standard for the 100 digital billboards now operating throughout the city. Two more digital billboards would be placed on an existing parking garage at the south end of the convention center adjacent to the 10 freeway. 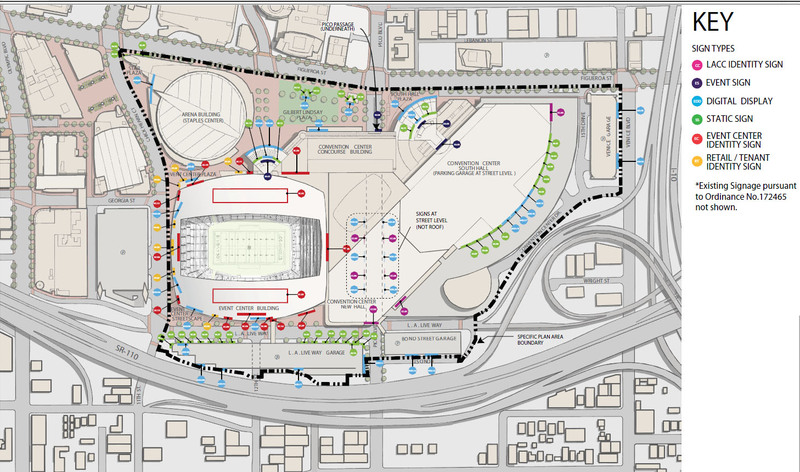 Seven digital billboards would be placed directly alongside the 110 freeway north of the convention center, on unbuilt parking structures, and another three digital signs on the outside of the stadium would be visible to drivers on that section of freeway. The digital signs directly adjacent to the freeways would vary from 1,000 to 1,200 sq. ft. each, for a total of more than 12,000 sq. ft, or the equivalent of 18 full-sized conventional billboards of the kind found on city streets. These signs would be in operation from dawn to 2 a.m. seven days a week. The plan for billboards on the convention center facade first surfaced back in 2008, when the City Council approved a deal with AEG, the owner of Staples Center and L.A. Live, to allow the Colorado-based company to erect and operate the billboards in exchange for a $2 million annual payment to the city. The only councilmember to vote against the proposal, Bill Rosendahl, objected in part to the idea of digital signs directly facing freeway drivers. He was later joined in that objection by councilmember Dennis Zine, who wasn’t present for the vote. 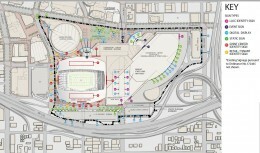 Then last year, when the NFL stadium proposal got to the City Council chambers in the form of a Memorandum of Understanding (MOU), the signage plan designated all those signs as “architectural digital prints” while some others with minimal or no freeway visibility were designated as “LED panels”. The MOU signage plan did not list signs to be erected on and around Farmers Field. However, after the city council approved the MOU, the LA Weekly reported that an undisclosed signage plan included digital billboards for that location as well as the convention center. See layout below of proposed new signs for Convention Center/Farmers Field area, including digital billboards. Click image to enlarge.